Amazon offers the VIZIO soundbar with wireless subwoofer, satellite speaker and 5.1 surround sound for $219.99 shipped, but Prime members get an extra $20 off bringing the total down to $199.99. If you do not currently have a Prime membership then you can sign up for a free trial here. This is the lowest price that we can currently find for this sound system and the lowest we’ve seen this year. This soundbar is rated 4.5/5 stars by nearly 1,000 Amazon users, and is Amazon’s best selling soundbar as well. This Vizio soundbar is wall mountable, and includes both digital and analog inputs, additionally it supports Bluetooth connectivity so you can wirelessly stream your music from a device. The rear satellite speakers connect to the wireless subwoofer offering a simple 5.1 surround sound solution without all the hassle of running speaker wire throughout your home. This is one of the few soundbar systems that can offer true 5.1 audio through the built-in Dolby Digital surround sound decoding. 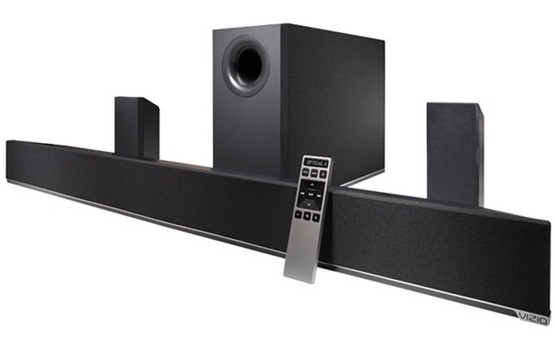 Additionally, there are a number of other soundbar deals currently available.